The Monstrance from the Church of Saint Ignatius of Bogotá (Colombia) is a treasure of the world’s Baroque art. Commissioned in 1700, by the Society of Jesus of the then New Kingdom of Granada, from José Galaz, a goldsmith of Spanish origin, and two other goldsmiths, it took seven years to complete. This extraordinary work of art is known as “La Lechuga” (the lettuce) due to the intense green generated by 1,486 emeralds, which shine alongside a fantastic Brazilian topaz, 62 Curacao pearls, 168 Indian amethysts, 28 African diamonds, 13 Ceylon rubies (Sri Lanka) and a sapphire from the Kingdom of Sion (now Thailand). A total of 1,759 gemstones of the highest quality are embedded in an 18-carat gold piece. The Monstrance represents a sun, surmounted by a cross, whose 22 rays end in other, smaller suns. Decorated with vine leaves and bunches of grapes, symbols of Christ and the Eucharist, the heavenly body is supported by an angel, a symbolic gure of the evangelisation of the Society of Jesus in America. At the base of the eight-lobed monstrance, grapes and vine leaves again appear among the decorative acanthus leaves and several zoomorphic gures interspersed with cherubs. Legends and myths surround “La Lechuga”, attempting to guess at its whereabouts on the several occasions when the members of the Society of Jesus were expelled from Colombian lands and the reasons why it survived the pro-independence struggles. “Missing” for many years, it was only when conscated property was returned to the Jesuits in the late 19th century that “La Lechuga” returned to the Church of St. Ignatius of Bogota, where it could be admired during several solemn celebrations. 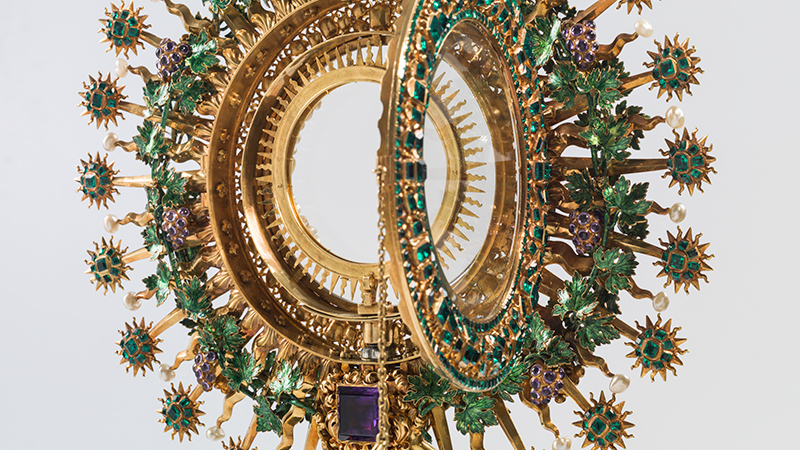 In 1985, the Banco de la República de Colombia purchased the Society of Jesus monstrance, for which it had to request authorisation from the Holy See. It has since been exhibited at the Banco de la República Art Museum in Bogotá. It left the country for the rst time in 2015, to be exhibited at the Museu del Prado as part of the parallel programme organised by ARCOmadrid’s invited country, Colombia, to coincide with the country's head of state visit to Spain.